The UK is renowned for it’s distinctive four seasons. With that pond owners should be well aware of the steps we need to take during each season to keep our ponds and their inhabitants healthy. The top concern for pond owners during warm summer months is the growth of green algae, which is a symptom of high nutrient levels. 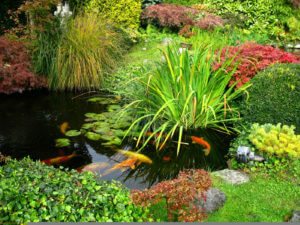 Garden ponds are intended to be enjoyed and not to be a burden on your time cleaning and maintaining them. There are a few basic rules to follow when building a pond and adding in aquatic plants and fish. These will help avoid time spent agonising over green water, fish parasites or a carpet of algae suffocating your pond. A fish pond sited in partial shade with the correct size pump and filter to volume of water is a great start to keeping a pond healthy and happy! Your pond is there to be enjoyed while sitting outdoors during those long summer evenings. By following these few summer maintenance tips and those of the previous 3 seasons, your pond should be a scene of tranquility and relaxation. This entry was posted on June 6, 2018, in Garden ponds. Bookmark the permalink.